A. Medicare will pay for some nursing-home coverage immediately after hospitalization, but it does not include a benefit that helps people who need long-term assistance, especially people with cognitive impairment or Alzheimer’s or who need other services that require substantial help at home. Nursing homes are expensive – $90,000-$100,000 per year – so even if someone enters a nursing home with their own resources, they quickly spend that down. Once they spend it down, Medicaid picks up the remainder of their care. Many good, hard-working, middle-class seniors who retire – if they or their spouse need nursing home care – quickly become unable to pay the full cost of their nursing home stay, and that’s when Medicaid kicks in. Q. Do poor seniors mainly receive Medicaid funding for long-term care services or for home care or for Medicare wraparound? A. Let’s put a basic fact about Medicaid on the table. The focus of the debate over the Affordable Care Act is around Medicaid’s role as a health insurer for low-income children and adults. But 9 percent of the people enrolled in Medicaid are elderly, and they account for 21% of Medicaid’s spending – they account for a larger share of spending than low-income, non-disabled adults and children. The disabled account for another 40 percent of Medicaid spending. Medicaid dollars are primarily going to people with disabilities and to the elderly, because they need more medical services than others. Q. Some will be surprised to learn that Medicaid also covers home health services. A. Medicaid is now the primary provider of home and community-based services, so individuals, including the elderly, receive this assistance. Everything on Medicaid is income-tested, so even those who receive home and community-based services have to qualify, based on their income and disability. A senior who has $100,000 of income would not qualify and would not be able to get care, but a senior living solely on their Social Security, without any additional resources, would qualify for Medicaid in most states. If you’re low income and on Medicaid, you can get assistance with modifying your home so that you can get up and out of a chair. You can get an attendant to come in and help with meal preparation, bathing and assistance. In some cases, you can get an attendant to provide virtually around-the-clock care. You can also get assistance going to an adult day care center if a family member who cares for you works and is unable to provide care during the day. Medicaid also provides advanced therapy and occupational assistance so you can stay in your community longer. Services also involve training family members to lift or move beneficiaries more carefully. And of course, some rehabilitation services are not covered by Medicare – so Medicaid funds more intensive treatment for low-income seniors. The goal is to keep people in their home as long as possible to reduce the number of people who have to depend on nursing home care, because most people prefer to stay in the community. Q. Medicaid is particularly important to elderly women, correct? A. Women tend to be poorer than men, especially women living alone. Elderly women living alone are not financially as well off as couples. Women also live longer, and we know that some of the real need for long-term care assistance and long-term services and supports occurs in advanced old age. The more you age, the lower your income tends to be as you outlive your resources, so women need Medicaid. Q. Our enormous health care system is often inefficient and costly. Is Medicaid a wasteful program? A. Because it is managed by the states, which have to balance their budgets, Medicaid is in many ways a very lean program. What drives Medicaid costs up are medical costs, which Medicaid can’t control. In recent years, the main driver has been expanded enrollment. During the Great Recession, for example, when more people became low income and lost their health insurance through their jobs, the Medicaid rolls expanded. And as baby boomers in the future are going to be needing long-term services and supports, especially the elderly who don’t have savings, their needs will swell the Medicaid ranks. Medicaid enrollment will be driven by demography. Yet the program’s per-person growth rate in spending is lower than Medicare’s in part because states really have cut back on payments and keep things pretty lean. The fear is if reforms put more constraints on the federal government’s willingness to match state Medicaid expenditures, the states will either cut back on home or community-based services – most go to the elderly and people on disability – or cut back on nursing home reimbursements. There’s not a lot of room in the Medicaid budget, especially when health care providers are already complaining Medicaid isn’t paying enough to fund the kind of care better resources could provide. One of the other cost challenges out there is home care benefits. We know that home care workers are terrifically underpaid. If you want to provide those services to the senior baby boom population as it grows, you really need to think about increasing workforce compensation. That would also involve additional spending. Q. Does Medicaid indirectly support the private insurance market via the Medicare supplemental plans, Advantage and Medigap? A. The low-income seniors covered by Medicaid tend to be sicker and have more chronic illnesses than those on Medicare who purchase supplemental private insurance. So, the answer is yes. When people are poor and sick and have lots of chronic illnesses, they’re more likely to be on Medicare complemented by Medicaid than they are to be in supplemental or retiree health coverage. The program does the same for the under-65 disabled population. Q. The proposed cut to Medicaid comes in the form of a structural change to the program. Currently, the federal government matches state spending. Would the bill being considered cap how much is spent on each beneficiary, reducing the resources to the Medicaid program? And how would seniors be affected by a cap? A. Today – and for its 52-year history – the structure of Medicaid has been that the federal government sets out rules for who can be covered by the program, and the states decide that they will cover that population and pay for their medical benefits. The federal government then has a formula that matches between 50 percent and 75 percent of state spending on that population. The theory there is that if healthcare costs go up, or if a new treatment comes onboard that makes hospital care more expensive, or if there’s a new drug for seniors with Alzheimer’s that the Medicaid program could expand to cover these new therapies – another example is increased costs for home care workers. If state spending goes up, the federal government continues to match it. Under the proposal, the government would say we’re going to lock you into whatever you were spending, per elderly person, in a base year, say 2016, and we’re going to add a national growth factor that says the federal share of your per-enrollee costs is only going to go up by the consumer price index [CPI] or some other inflator. That inflator determining the federal share is going to be the same across the entire country. If you’re in a high-cost state, your state will be locked into the same growth rate as a state with very low health care expenditures. So it’s going to really limit how much the federal government will contribute to state spending, which will put pressure on the states to reduce spending. The other thing that’s very different about the proposal is that this is the federal government setting a growth rate that might look pretty generous this year, because it’s going up by the CPI plus 1. This sounds complicated, but it is a mechanism by which the federal government is putting on a cap that it can adjust downward and will put real pressure on state’s long-term care spending on nursing homes and community services. The second thing that would happen is that the federal spending is trended forward based on what services a state was providing in a base year. So if you’re a state that wasn’t doing a lot of community and home care – mainly providing nursing home care— and wants to expand coverage to provide more community based care – this per-enrollee spending cap locks a state into the prior spending level for services and does not allow federal funds to increase to cover new or expanded benefits. Thank you for providing details on Medicaid and how this is a primary source of funding for our seniors in long-term care, since many are not aware. 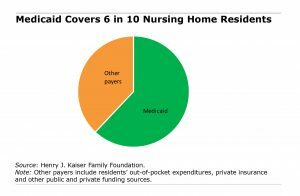 I’ve always been told that Medicaid funding for nursing facility residents in TX was one of the worst. Does this mean our state provides low funding to LTC facilities? Also, LTC admission criteria for Medicaid funding has changed since I started working in LTC 26 yrs. ago. Most people are not aware that an individual not only has to meet the financial and physical requirements, but also has to have a type of Dementia that is diagnosed. I recall having residents on Medicaid that were fairly alert/coherent and ambulatory years prior. A lot has changed.